DIVERSIFIED WOODCRAFTS Art/Drafting Table - 2 piece adjustable This durable art/drafting table is built for many years of classroom service. It is constructed of solid maple framing, secured by a combination of mortise joints and tenon joints. These joints are reinforced and anchored by steel plating. The whole body is preserved by mutiple coats of lacquer to retain and enhance the beauty of the wood. The frame is overlay with a two-piece fiberesin top that is 3/4" thick. The larger section of the top is adjustable allowing the student to work in the most comfortable or practical position. Soft-close technology slowly shuts the raised section without letting it slam down. 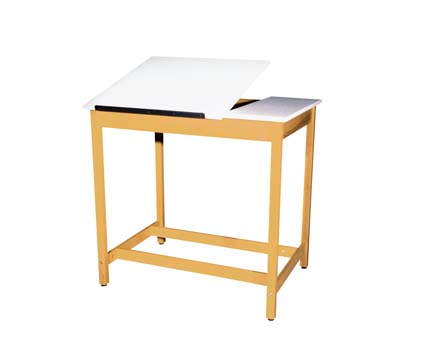 The tilting top also features an incorporated pencil stop to keep papers, books and writing utensils from spilling to the floor when the top is in motion. Overall size: 39-3/4" H x 42" W x 30" D.